I am in the middle of a small project that requires considerable collaboration amongst people not used to collaborating. Always challenging. 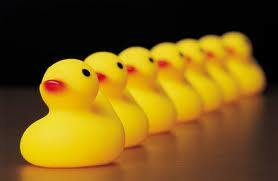 “Sometimes people spend huge amounts of time and energy getting their ducks in a row. Pity it does not really matter what they look like, it is what you do with the ducks that counts”. What are you doing with your ducks? This entry was posted in Alliance management, Communication, Management and tagged Agriculture, Alliance management, collaboration, communication, managing yourself. Bookmark the permalink. 1 Response to The old duck metaphor.